Yippee!! I adore the unmistakable, unique flavor that is maple. Growing up we didn't eat real maple syrup on our pancakes. 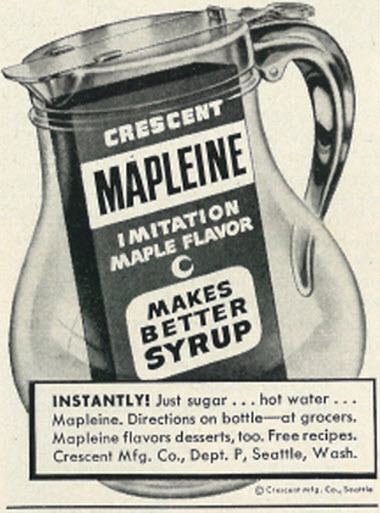 My mom would use Mapleine flavoring in a sugar syrup for us to use. 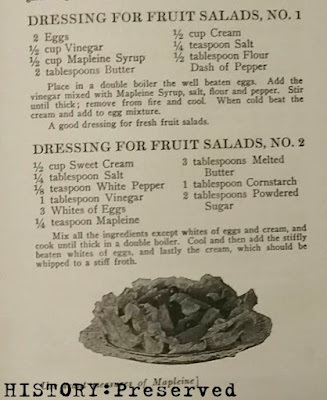 It tasted okay, I just didn't like how runny it was. So, I started adding the Mapleine flavoring to honey, which was much thicker. Maple honey is pretty good! Now, I splurge to buy the good stuff - real maple syrup. And every April we trek over to the 18th century market fair at Ft. Frederick, Maryland where a man sells his Special Dark maple syrup that he makes himself. We make that quart of deep amber goodness last all year long and savor every drop. It's that good! 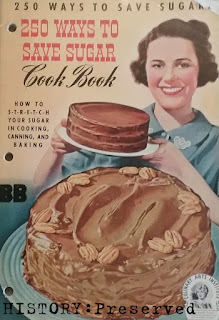 Maple seems to be a flavor that crops up in autumn time, and I've come across some pretty fabulous-looking vintage recipes featuring this purely North American flavor, so that's what I wanted to showcase. 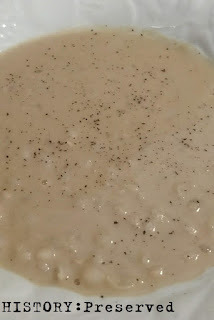 I'll be sharing two recipes every week for the autumn season, so check back every Saturday! 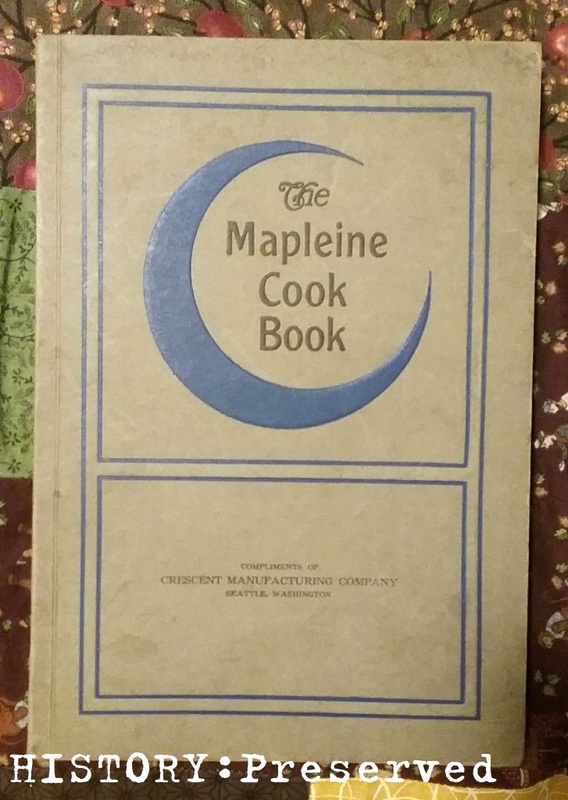 This week's recipes come from The Mapleine Cook Book, dated approximately to the 1930s. 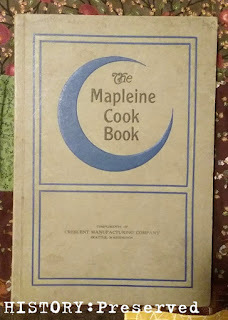 I was so excited to acquire a vintage Mapleine cookbook and can't wait to share some its recipes with you. 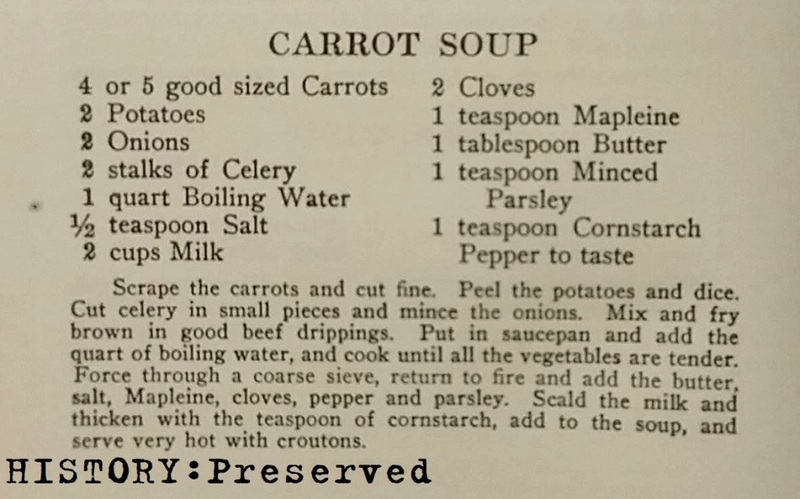 So, here are two recipes where you might not think maple flavoring would be an addition: Carrot Soup and two different dressings for Fruit Salad. Interesting, eh? A most wonderful, Happy Autumn to you all! That is a pretty neat ad. 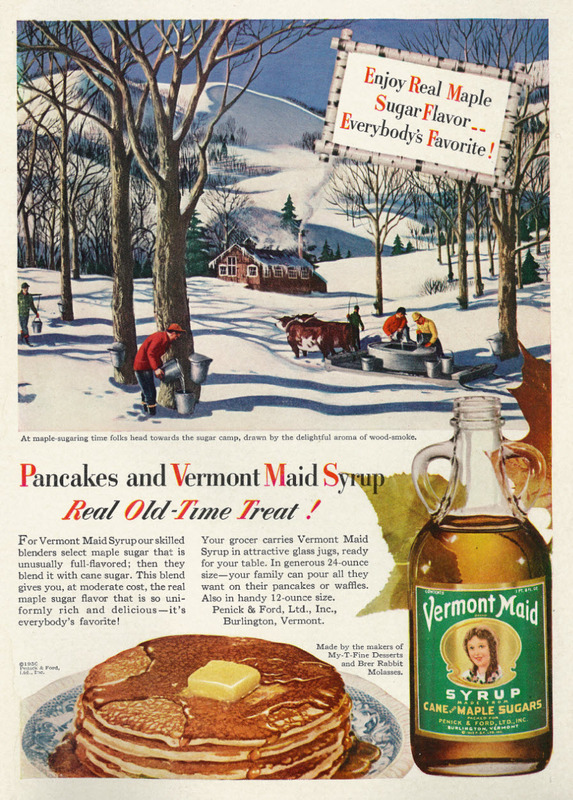 I didn't know that Vermont Maid was actually Vermont made. I'm from a town about 15 minutes from Burlington originally. Now I'm curious to see if it's actually made here. I bet back when this ad was current it was a semi decent product since they used real maple and cane sugar. Isn't it funny that maple is a flavor that we associate strongly with fall even though it's produced in late winter or early spring? 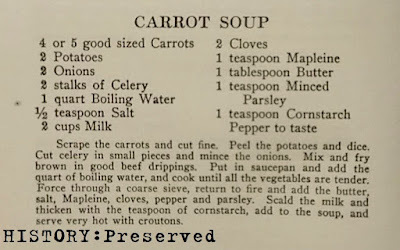 It's just so perfect with apples, pumpkins, squash and root veggies! It really is a neat ad! I just assumed it was made in Vermont because of the name, but that doesn't mean much, does it? haha! 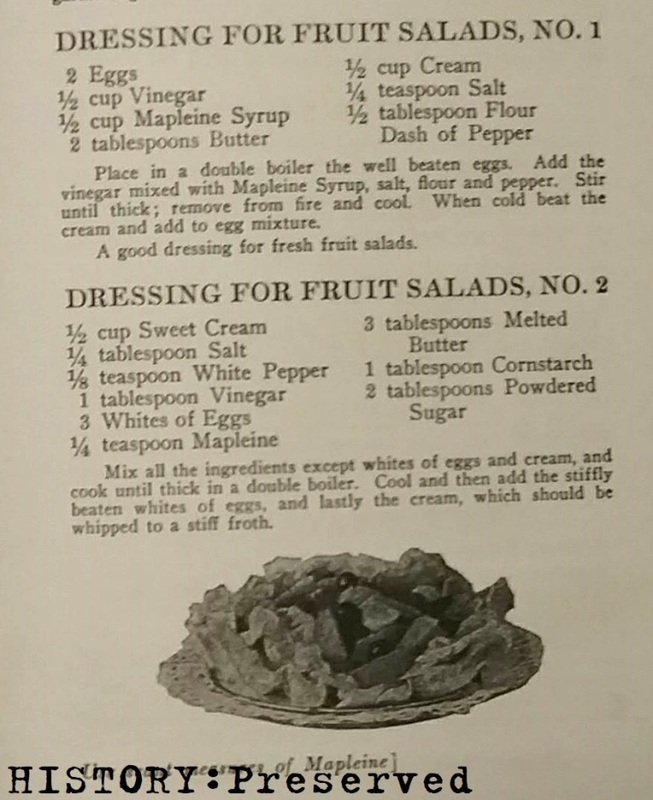 I think it sounds like a nice syrup - a precursor to today's pancake syrup, maybe? I've been wondering the same thing about the maple thing in the fall. Sugar maples aren't even tapped then, are they?